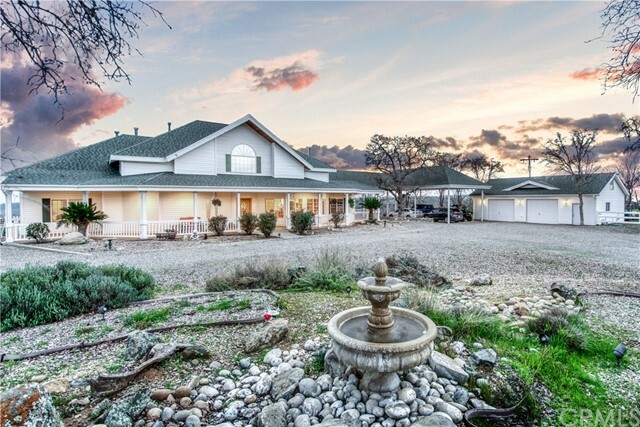 GORGEOUS CUSTOM ESTATE with million-dollar view overlooking San Joaquin valley, just 40 min from Fresno, 45 min from Yosemite so. entranceperfect for exploring all the area offers. White vinyl fencing wraps driveway as you make your way through 39.48 gentle hilltop acres, completely fenced/cross fenced (7 pastures). Custom home features 3 bed/3 ba +office w/built-in cabinetry, isolated master ste, lg laundry rm, over-sized entertaining areas, gourmet kitchen. Living rm boasts 24-ft vaulted ceiling, panoraGORGEOUS CUSTOM ESTATE with million-dollar view overlooking San Joaquin valley, just 40 min from Fresno, 45 min from Yosemite so. entranceperfect for exploring all the area offers. White vinyl fencing wraps driveway as you make your way through 39.48 gentle hilltop acres, completely fenced/cross fenced (7 pastures). Custom home features 3 bed/3 ba +office w/built-in cabinetry, isolated master ste, lg laundry rm, over-sized entertaining areas, gourmet kitchen. Living rm boasts 24-ft vaulted ceiling, panoramic view of foothills beyond xl covered patio, pebble-tec infinity view pool. Covered parking for 6+ vehicles, full RV hook-up w/sewer, water, elec. Barn features 3 stalls, tack room. Hay barn (also can be boat/RV parking), lg riding arena. Detached garage has full bathroom, washer/dryer hook-up. Too much to mention, ask your agent for MLS attached features listIf you've been looking for a usable mountain estate, you understand they are hard to come by! Call today to schedule appt!